Sophomore Nursing student Maria Castiblanco has found ISU to be the perfect fit. “Going away to college” is a goal for some students. A few years ago, Maria Castiblanco, a Bloomington-Normal “townie,” included herself in that group. Now Castiblanco considers herself part of many other groups instead, including the Illinois State University Honors Program, University Scholars, Mennonite College of Nursing, and the St. John Paul II Catholic Newman Center. Originally from Colombia, Castiblanco came to Illinois with her family in 2000. Her parents did their master’s coursework at Illinois State and loved the University. Castiblanco attended Epiphany Catholic School and Central Catholic High School. It was at a scholarship dinner with donors that Castiblanco first met Ed McKibbin, ISU students’ attorney. At the time, Castiblanco was unsure about her major. She knew she wanted to help people, and had considered careers in law, nursing, and theology. McKibbin gave her a tour of campus, showing her the nursing facilities and introducing her to faculty members. Ultimately, Castiblanco felt that the Mennonite College of Nursing was the right fit for her, and the fact that she got to follow in her great-grandmother’s footsteps provided additional meaning. “My great-grandma studied to be a nurse during World War II,” Castiblanco said. “She was studying for her master’s at Columbia University when she met my great-grandfather, a Colombian businessman.” The two corresponded for a year before getting married and moving to Colombia. Castiblanco is proud to continue her great-grandmother’s legacy. “My grandfather told me his mother would be proud, and gave me a box of her nursing pins,” Castiblanco said. 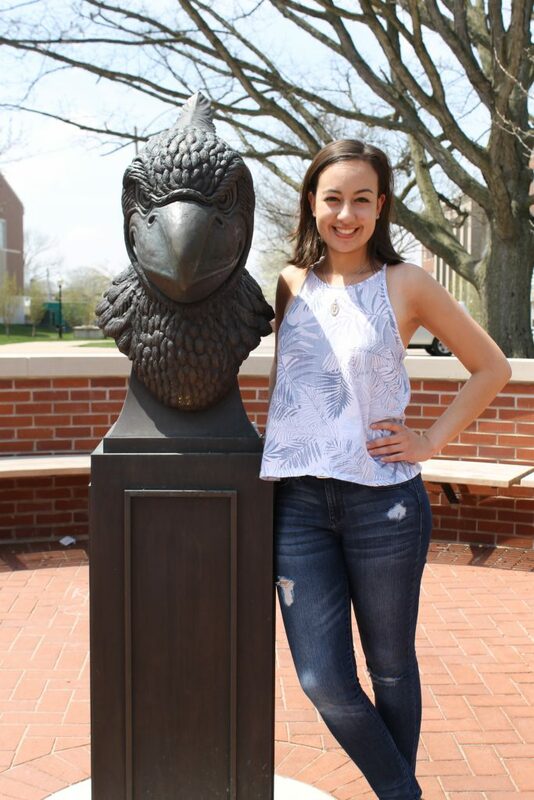 Maria Castiblanco is a proud Redbird and Bloomington-Normal resident. Castiblanco is very involved on campus, which she said has helped her find the right balance. When not in class, at home, or volunteering, Castiblanco can often be found at the Newman Center. Last summer, Castiblanco went on a mission trip to Miami with students and staff from the Newman Center.